Do an update install. A clean install is not required. The localization clean-up may cause undesirable side effects. Please report any unusual or unexpected words and phrases. And, of course, any other weirdness or unexpected behavior. This TestFlight release is free, but will expire on June 23. Okay, I got this version on my phone after more struggle than I would have expected. 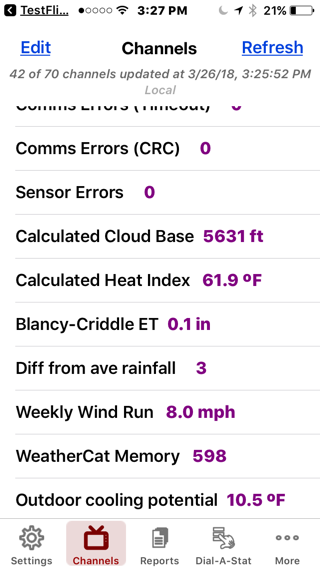 For the second time in as many updates, Test Flight hangs instead of updating WeatherCatRCP. I had to reboot my phone to get it working. When I finally got this version installed it had lost my local installation of WeatherCat 3. I had to switch to Stu's engineering WeatherCat and switch back to get WeatherCatRCP to recognize my WeatherCat installation. 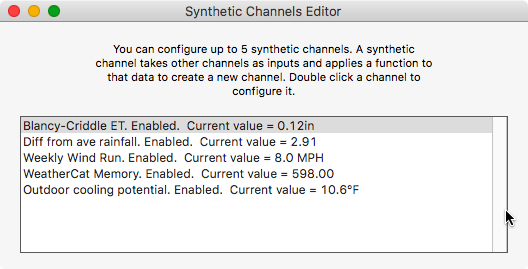 Any reason why this synthetic channel isn't displayed with decimal values? Thanks for your hard work on this app. It is really neat! Updated through TestFlight. Installed with no problem. Didn't experience the issue reported by Edouard. Everything looks fine to me. iPhone 8+ running iOS 11.2.6. Thanks Grand. And special thanks to Mrs. Grand for supporting your weather hobby for the rest of us. Updated to 1.0 (180326) without problems. All looks unchanged from the previous version on IOS and Watch.